No other headset has the world wide reputation the Record has, as the best un-sealed bearing headset in production. This reputation comes to it because Campagnolo over many decades has produced bike parts to the highest measurable standards without regard to cost. The Record is the height of their art. The Record headset come in three models depending on the diameter, the HS-01 is the 1" diameter and is sold in the Record road parts grouppo and the Record OR mountain parts grouppo, the HS-03OR is the 1 1/8" diameter size sold only as Record OR, and the HS- 04OR is the 1 1/4" size also sold only as a Record OR headset. 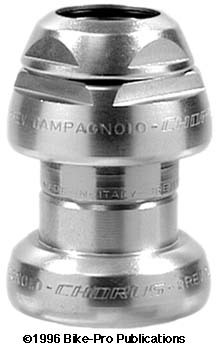 Apart from the quality of the workmanship, another feature of the Campy Record series headset is that they have four grease injection holes drilled through each of the upper and lower cups to permit re-lubrication without disassembly. The cups are made of aluminum alloy, whether they are forged through casting, powder metallurgy or machined from aluminum rod isn't clear. After the initial shaping of the cup pieces, the parts are machined to further develop the shape, cut threads, de-burr, perfect the roundness and drill the grease injection ports. 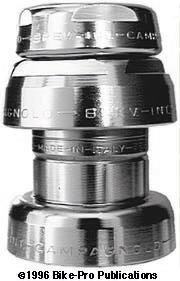 The upper cup has four cuts on the top, made to produce grip edges for a headset wrench. The steerer threads are immaculately tapped. Both cups have a highly polished, precision cut, steel race for the ball bearings. The outer surface in the area of the injection ports is recessed slightly, and a Black rubber-like band covers the entire circumference when you are not re-greasing the bearings. 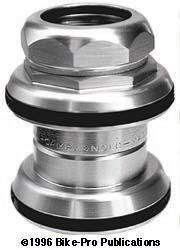 The head lock nut is also made of aluminum alloy and also, like the upper cup, has four cuts made across the top for the headset wrench top grip. It has a channel milled for an O-ring stem seal. A recess in the bottom of the head lock nut encloses the headset washer, (which is stamped from steel), to assist in locking all of the upper pieces tightly together. Each of these aluminum parts has, as a final step, been given an intensely high polished, mirror- like finish. The fork and upper cup cone races are made from steel. The areas not in bearing contact appear to be chrome plated, with the race area machined to deliver a finely polished surface. A recess around both cone races is filled with by a Black rubber O-ring that seals dirt out of both bearing cavities. Each of the bearing assemblies has twenty 3/16" diameter steel ball bearings held in a steel retainer. 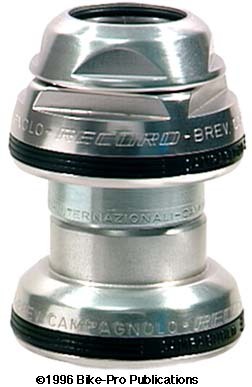 There are some oddities about the 1 1/8" and 1 1/4" Record, (and therefore Record OR) headset. The Record 1" as pictured , and written about states that there are four grip surfaces for the head wrench. The 1 1/8" and 1 1/4" size have eight grip surfaces and lack the high polished surface of the 1" diameter. We were surprised when we took delivery of the two oversized models because they were so different in appearance from the 1" moreover the 1 1/8" and 1 1/4" headsets arrived as merchandise for sale, through normal distributor channels, in Euclid headset boxes with modest "Record OR" labels affixed over part of the Euclid logo. The explanation for using boxes from a two year discontinued headset is that Campy Italy had them on hand and wanted to use them, laudable but confusing, especially with the stick-on labels exclaiming "1992 NEW PRODUCT". In fact the only way we could authenticate the contents was to call Campy USA in Carlsbad, California and have Jeff mention to us that the Record OR photo showed a satin finish though the Record didn't, and the two headsets received had the necessary grease injection holes beneath the removable rubber ring. Specifics about the weight and stack height of the three units are available in the Headset Table.